Like most people, your air conditioner’s outside unit needs its space—otherwise it cannot work properly. To know why, you need to know how a central air conditioner works. Your central AC has an indoor unit and an outside unit. The inside unit absorbs heat from your home’s air and then transfers the heat to the outside unit, which then dumps the heat outside. However, a decorative air conditioner cover restricts airflow around the unit. Restricting airflow can cause the air conditioner’s compressor to overheat and die. That is awful news for you. The compressor is the metal “heart” of the outside unit. In addition, once it needs replacing, you might as well replace the entire outside unit. Yes, a compressor is that expensive to replace. All these restrict airflow and cause your AC to work inefficiently, meaning you have higher energy bills. One common problem we would like to highlight here is dirt. The outside unit is always exposed to the outside elements, so the unit often gets covered in dirt, dust, grass and leaves. That is why air conditioning manufacturers recommend an annual checkup. Get one from Aloha Ac Rheem® air conditioner contractor today now! 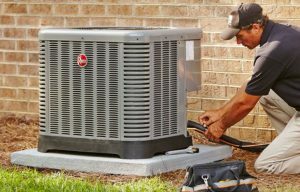 Call Aloha Ac Rheem® air conditioner contractor Today serves the air conditioning needs of Broward and the surrounding cities. That is why you should clean the outside unit at least twice a year. You can either clean it yourself using a special coil foaming cleaner and water sprayer (make sure you use a gentle setting). Alternatively, you can have a professional do it. Most contractors will wash the outside unit as part of an Air conditioner maintenance visit. In South Florida, your Air conditioner needs maintenance at least twice a year because we use it so often. Maintenance also helps prevent the AC from breaking down, which is a handy benefit if you want constantly cool air during our sizzling, wipe-your-sweaty-brow-every-5-seconds summers. Spring is usually your best bet to get maintenance, because it is easier to schedule an appointment with a contractor. Customers can count on Alohaac Rheem® Air Conditioner Contractor for the right residential Rheem® air conditioning system; at the right price and at the right time. Our reputation and experience give our residential customers confidence and peace of mind. Contact us today for a free quote. We are at your service, just a phone call away. 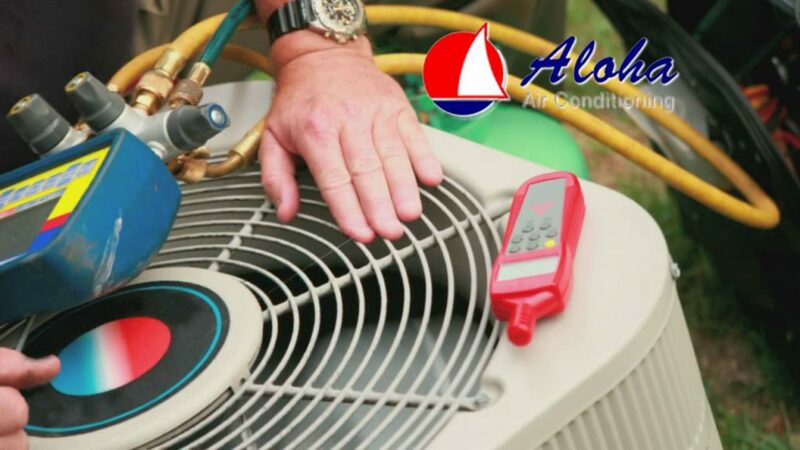 To learn more about our air conditioning installation services, contact the Aloha Rheem® Air Conditioning Contractor office today at 855-88-ALOHA (25642). 1. Don’t let your HVAC work more than is necessary. And don’t let your office get too hot before turning it on. It’s key to regulate your temperature so as not to stress your unit. Keep doors and windows closed when your AC is turned on, and keep shades and curtains drawn on very hot days. Avoid having direct sunlight streaming in through doors and windows. As much as possible, don’t operate other heat-generating appliances in the daytime when your AC is going to be working. 2. Replace your air filters on a regular basis. Do this at least once every 3 months. Experts estimate that you can reduce your energy cost by as much as 10% by keeping up on this task. And the cleaner air will benefit your staff’s health as well. Air conditioning energy assessments are often undervalued! 3. Keep your thermostat constant. Changing your thermostat’s setting constantly can result in inefficiency. If you wish you can increase the temperature by a few degrees in the day time while you are away. When in cooling mode, switch on your AC fan to prevent hot or cold pockets from forming. This can also help prevent your condenser from icing up. 4. Keep your outside unit free of dust and dirt. Clear plants and other items from around its perimeter for at least 12-18 inches. Ensure also that indoor vents remain unobstructed to keep air circulation going for industrial air conditioning, this is so important. 5. Schedule regular tune-ups Have a reliable HVAC technician perform maintenance checks on your unit, preferably before the beginning of summer. Our staff is fully trained in the HVAC techniques required to ensure this process is carried out efficiently. The result is that your air will be fresher, easier to breathe, and less likely to cause allergic reactions. To learn more about how our Air Duct Cleaning Fort Lauderdale services can benefit your home, contact the Aloha Air Conditioning, Inc. office Toll-Free today at 855-88-ALOHA (25642). Clean Condensate pan and lines. Check Temperature split across coils. Check Electrical components for amp draw and operation. Check unit for External Corrosion. Check Belt wear and adjust tension. discount on any regular service provided throughout the year. will be billed at current retail prices unless covered by warranty. Coil Cleanings and common multiple drain or common multiple condensate line problems. Replacing blown fuses, Resetting of circuit breakers. Improper settings of thermostat or other controls and adjusting grills. All work described above shall be performed during regular working hours which are from 8:00 a.m. to 3:00 p.m. Monday – Friday. Aloha reserves the right to charge overtime for work performed during periods other then regular working hours. This contractor assumes no liability for operation of the equipment. Under no circumstances will this contractor be liable for subsequent or speculative damages, or injury due to the use or the failure of the air conditioning system. This agreement is not intended to maintain indoor air quality. No service will be rendered under this agreement if customer has past due account. year to year. Cancellation by either party requires a thirty- (30) day prior written notice. The Fresh-Aire UV Light reduces odors, toxic chemical vapors, germs and mold in your home. A lot of people ask, “Does the UV light produce smells”. Well the answer is yes, some brands do for a short period of time after being newly installed. However, the brand we offer does not produce any noticeable smell after install. The FRESH-AIRE UV light is installed in the duct-work of your central air system and is designed to help reduce odors, toxic chemical vapors, germs and mold in your home. How does the UV Light work? By removing airborne contaminants as the air is circulated by the central HVAC system. Using a proprietary absorption media to capture VOCs (Volatile Organic Compounds) then reduces the captured constituents through an innovative photo-cytaltic oxidation process (PCO) which breaks them down into elemental carbon dioxide and water vapor. As odors and chemical contaminants circulate through your air handling system, the ultraviolet light unit utilizes a highly absorptive carbon media which captures these contaminants, removing them from the air stream, much like a sponge absorbs water. During the off cycles of the air handler the UV Light self-regenerating photo-catalytic oxidation process breaks down the captured contaminants and frees up the carbon cell to be able to capture additional airborne VOC’s and odors. In addition to the units system’s ability to absorb airborne VOCs, the UV light helps to maintain the cleanliness of your central ac system by shining on the duct-work, cooling coils, heat strips and blowers that are prone to biological growth that can contaminate and clog the system. For over a century scientists have known that certain frequencies of light have a devastating effect on microbial life. We now know that exposure to ultraviolet light in the range of 254 NM (UV-C band) disrupts the DNA of micro-organisms, thus preventing them from reproducing, thereby effectively killing them. Over time mold can build up on cooling coils. this is a health risk that robs the air system of efficiency and requires cleaning with chemicals. The germicidal UV light inside kills mold and keeps the coil and air system interior clean. Recent studies have shown that the level of invisible airborne organic chemical and odor contaminates in our indoor air is generally two to five times higher then the levels found outdoors. while some of these substances merely smell bad, others can be extremely harmful. these contaminates, known as Volatile Organic Compounds are carbon-based chemicals that easily evaporate at room temperature. The unique technology inside the Fresh-Arie UV helps to eliminate VOCs, making your home a safer and more pleasant place to live. We look forward to discussing your home air quality with you. Aloha Air Conditioning is South Florida’s best way to “Go Green” while saving some “Green” (money)! Whether your -reason is to save the earth or save some money, we have the highest efficiency units available at excellent prices and the best service anywhere. Also, right now, there are excellent rebates, deals and specials from FPL and the federal government that can save you THOUSANDS! Call us today at 954-772-0079 and learn how Aloha is the best way to Go Green!